.In making these simple, but elegant mugs I use several different clay techniques. First I throw the body of the mug on the wheel and and alter it to its shape shape. A mold is then made and the body is slip cast and when leather hard the handles are then added by hand. 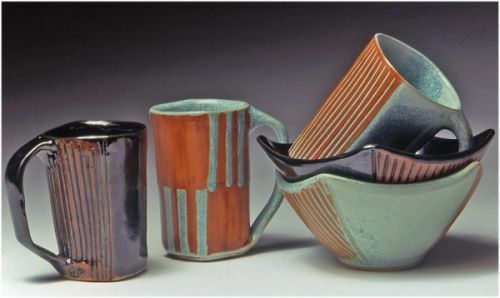 The mugs are then fired and one of 12 related designs are added using latex resist, They are then dipped in glaze and the latex is pulled off and the clay underneath is then stained, giving a beautiful burnt orange color to the design. They are then fired to a high temperature providing durable mugs for many years use. They are microwaveable, dishwasher and food safe. They are sold in sets of 4, each with a different design, (unless requested to have them match.} They have been written up in the New Yorker Magazine and are one of my best sellers.